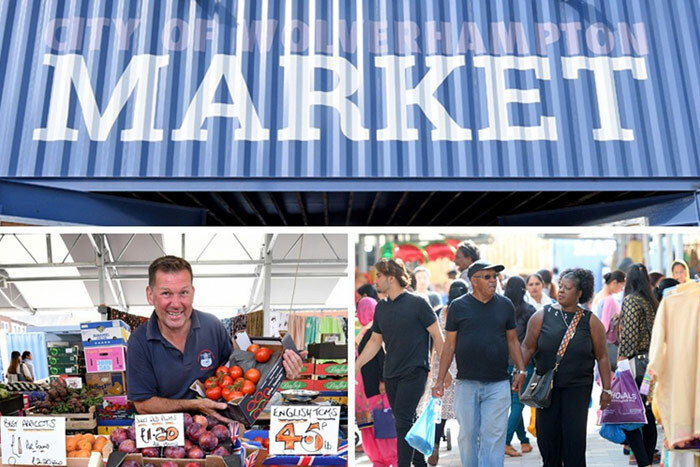 Punters old and new flocked to Wolverhampton’s £4.9 million market on 17th July as it opened to the public for the first time. The new market was teeming with customers on its first day of business since the move from Market Square to opposite the Wulfrun Centre on Cleveland Street. And, despite some controversy over the market’s shipping-container entrance, there was a feel-good factor among both shoppers and stall owners, who were optimistic about their new surroundings. Market trader Munir Hasson, who sells a range of clothing, said: “It’s really nice, it’s spacious and light, really great. “I was at the last location for about four to five years and I did like it there, but I think this one is just as good. Fruit and veg stall holder Richard Latham said: “It looks fantastic, it’s much better. The old market looked tired and needed a refurb. Richard’s fruit and veg competition Julie Emery added: “We like it a lot, it’s absolutely fabulous, much better than the old location and we have all the buses and transport links here. Butcher Robin Newby from Codsall said: “It’s a lot better here, we’re more central and it’s pushing trade. “The place looks great, it’s up to date but has a rustic feel. Taking in the bustling stalls and array of colours and smells, customers complimented the new market – but some were still sceptical about the entrance, which is made up of one large blue container resting on top of two others. Angela Iguodala from Wolverhampton agreed about the positive transport links.